LG brand NEW Single Door 4 star 192 Liters Refrigerator. #101, Balaji enclaves apartments, iti Layout, kathriguppe, Banashankari 3rd stage Bangalore. The 7 year old refregrator. With a good working condition and consumes less electricity. The accessories are given free along with refregrator. A brand new fridge bought for 11k, used only for 3 months. Kenstar 80 L, Direct-Cool Single Door Refrigerator (NH090PSH-FDA/N C090PSH-FDW, Silky Grey / Silver Hairline). 2016 model. Selli ng it due to relocation, best for bechelors and small set-up. 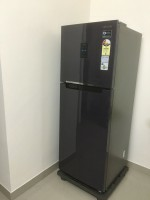 Haier fridge bought on 12.05.2018 1. 195 L 2. 4 star 3. Energy consumption : 151 units per year 4. Model/Year : HRD-1954/2018. The fridge is in perfect condition and is 8 years old. Toshiba double door refrigerator on sell it is in good condition & working.